What people thought was impossible is not! There is a software that can totally extract a text from an image or PDF file and output it as a Word file – Free OCR to Word. This software is considered the best OCR software to convert image to text since its performance is excellent, its interface is very attractive, the process of converting the images is simple and fast, and its download is free. Is it possible to convert images to text? Who needs Free OCR to Word? How to convert PDF files or images to an editable Word document? Yes, it is! OCR stands for Optical Character Recognition. This technology allows Free OCR to Word to recognize characters in images and PDF files, so it can copy and extract the text to then paste it in another window. The developers of this software have made sure that the accuracy of the technology used here is as high as possible, so it does not matter if the image is low-resolution. 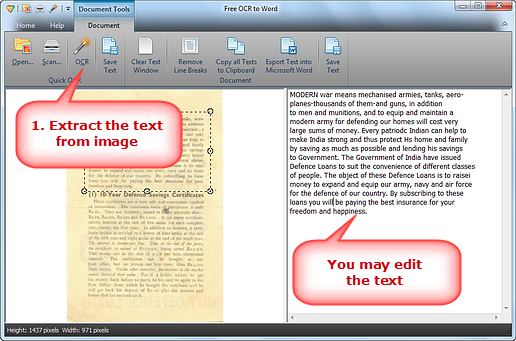 Free OCR to Word it is not only possible to recognize and extract texts from an image or PDF file, but it also guarantees a great performance while doing so. It is quick to extract a text, and it is simple to edit it and output it as a Word or TXT file. Free OCR to Word does what people thought was impossible. There are no limits. You can convert image to text as much as you want and need from all type of PDF files or images. It does not matter the format of the images, Free OCR to Word works with PNG, JPG, JPEG, PSD, and many other formats. It also does not matter where the image come from. Whether it is an image you downloaded online, or something you scanned from a magazine, book or paper, Free OCR to Word will do its job flawlessly. It is not only available the option to convert image to text, but also to edit it and outputting it as a Microsoft Word document. Its OCR technology is as high and accurate as expected. Experts claim that its range of accuracy is 98%. Thanks to this technology, it is possible to convert image to text, even when the image is a low-quality one. It is totally free to download this software. You do not need to pay anything for it, nor to register in any website. It is safe, practical and easy to use due to its interface. All these make Free OCR to Word the best OCR software to convert image to text. Everybody can find useful this software to convert image to text, and learning how to use it is an effortless task. Students and professors will find very useful this software. Students can use it to extract paragraphs from PDF files to quote in their texts. Professors can extract PDF files to use on their classes. They can also receive essays, research and any other type of homework as a PDF file or image format and then convert them into texts. Writers will see that this software comes in handy for their work as well. 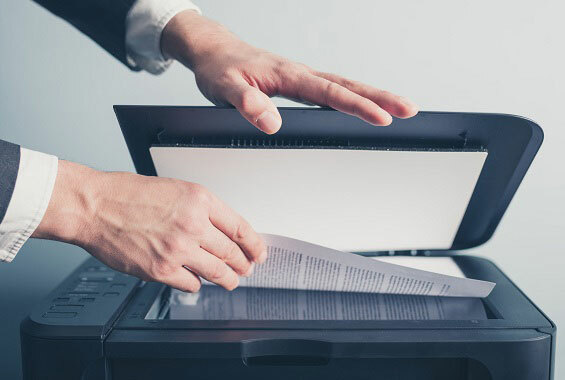 Sending their writings as an image format or PDF file and then extracting them with Free OCR to Word is definitely better than sending them as Microsoft Word documents. 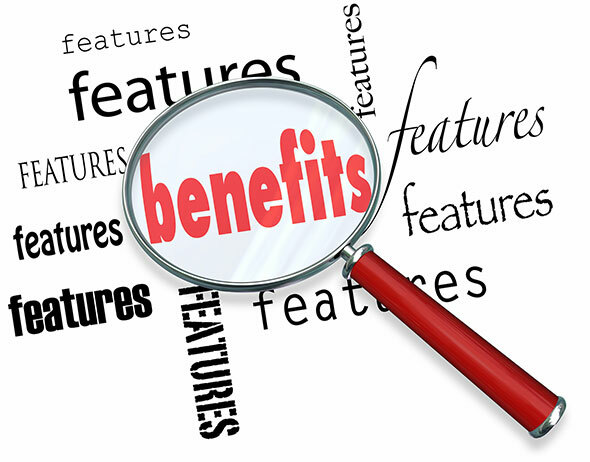 Freelancers who work at long distance can send their work to clients as images or PDF files. It will be safer for both parts. Step 1. Select the text you want to extract. After you open the image file, you need to fit the image, reducing or enlarging it to the right size. Then, select the part you want to extract and convert. Remember that the format of the image file does not matter, Free OCR to Word can convert picture to text whether the image is a JPG, PNG, TIFF, or any other format. If you need to rotate the text or zoom it, the tools bar above the text will help you to do that. Step 2. Extract the text. Click “OCR” to extract the text you already selected. You will be able of editing the text in the right window where it will be displayed. The tools bar will display some options which will make easier for you the process of editing the text after extracting it. If you need to erase things from the text or to add some others, you will totally do it. 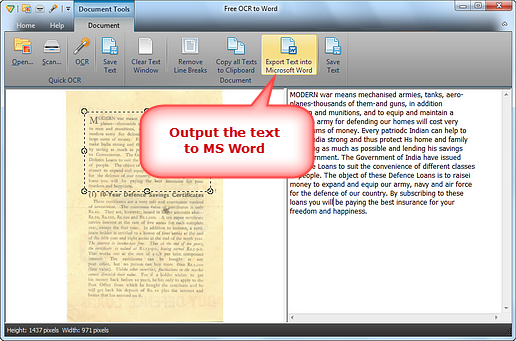 The option “Export text into Microsoft Word” will let you output the text you extracted from the image file. You can also save the text afterward and do whatever you want with it. 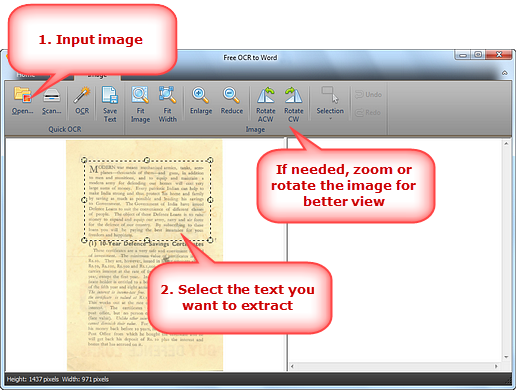 OCR to Word is without a doubt the best OCR software to convert image to text. Its efficiency has already attracted many users, and since it is free and its download does not imply any malware or spyware to any computer, more and more users are downloading it. Things you thought were impossible are totally possible with this great tool. You can now forget about the cumbersome task of reading a low-resolution image, a very old book with tiny characters, or spending hours transcribing texts as quotes for your papers. The best part is that there is no limit, you can repeat this process with all the texts you have. Each performance will be as great as the previous one.